Lemongrass House is a brand I hadn't heard of until recently. The brand originated and is based in Thailand. All the products are handmade there using no animal ingredients and haven't been tested on animals. They don't contain any parabens, sulphates, dyes or perfumes. The natural ingredients found in milk add moisture to the skin, improving its appearance. The lactic acid in milk contains natural beta hydroxyl acids which exfoliates and soothes the skin. Milk naturally contains Vitamins A & D which help the skin stay soft yet strong. Milk also eliminates dead skin cells from the surface. I was super excited when I was sent the Virgin Coconut Bath Milk*. 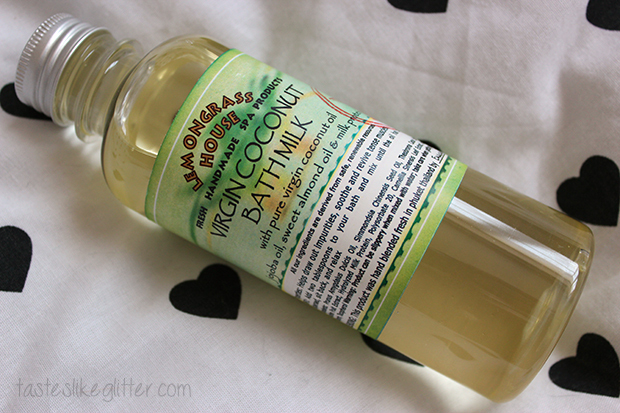 I am a total coconut fiend and this doesn't disappoint. The scent is delicious, natural and not at all overpowering. I pour a little of this (as it goes a long way) under hot, running water and swish around until the bath water turns milky looking. It's perfect for those with sensitive skin as it contains only natural ingredients but the bath milks don't produce any kind of bubbles, so won't irritate. The oils in this really help to moisturise the skin. I found when shaving I didn't need any other products, usually I use a gel on my legs. Using this in the bath meant it eliminated my need for any extra products as the razor just glides easily over the skin. Usually if I skip moisturising after bathing my skin feels really dry but when using this it doesn't at all. On first look I did think this was a little overpriced but the fact that it's handmade, natural ingredients and you only need a small amount, I feel like that justifies the price point and it's something I would definetly buy.